Today I want to take you on a little tour through the history of audiobooks to show you why they matter. Currently in 2018, 18% of US consumers listen to audiobooks, compared to 74% readers overall, 67% print readers and 26% e-book readers (1). There are two defining factors in the audio success story: The first is technological development. Prior to the LP we already had radio plays. But a talking book that you could consume on your own schedule was an impossible thing. The cheaper and more convenient technology has become, the more popularity audiobooks could gain. Now, I’m not claiming that only disabled people listen to audiobooks or that they are meant only for disabled people. I’m trying to show you why their inclusiveness is an important feature of audiobooks that deserves appreciation, no matter whether you are a listener yourself or not. As readers we generally like to think of ourselves as open-minded, well-read, aware. That’s why, fortunately, the “print vs. e-book vs. audiobook“-debate has considerably quieted down and usually only takes on the form of: “Of course every book format is equally great!” Unfortunately, I have never found a post on this topic that made a big point out of the importance of audiobooks for disabled people. Sadly, as it is so often, the not fully able-bodied remain mostly invisible. A while ago I asked in a Facebook group (Audiobook Addicts) why people liked to listen to books. As expected, a lot of them said they listened during commutes or while doing chores. Many said that, like me, they were avid readers but didn’t have much time anymore to sit down with a book. But some also mentioned that they weren’t able to read print or e-books due to disabilities or cognitive impairments. …. audiobooks were invented for blind and disabled people? …. some diseases like MS can make it difficult to hold a book or an e-reader? …. brain injuries and brain fog can make it difficult to read? Audiobooks are not for people who are too lazy to read “a real book”. Audiobooks are for people who can’t read the words, who can’t hold up a book, but also for people who are so crazy about books that they couldn’t bear not having them in their lives anymore because they work long hours. There is a big number of avid readers among the blind and disabled since – as we readers are all well aware – : Books are uniquely able to transport the emotions necessary to let us experience something that we cannot experience in reality. In 1931 the American Foundation for the Blind and the Library of Congress Book for the Blind Project cooperated ion the “Talking Book Program” which developed the audiobook. At this time the amount of books that were recorded as well as their distribution was limited. The Bible, the constitution and only few fiction pieces were available through postal service. In 1948 Recording for the Blind & Dyslexic was formed. “Learning Ally” started to provide text books for blinded WWll veterans to support their college education. LP records were invented in the same year. In 1952 Caedmon was the first publisher to bring out an LP recording of poems and a story, read by the author. It became unexpectedly popular and turned the publisher into a household name. The invention of the cassette in 1963 was a game-changer. Where before only few libraries offered recordings, this swiftly changed now and in the 1970’s all libraries were carrying audiobooks. With the new technological means audiobooks kept gaining in popularity. In 1985 21 publishers offered audiobooks and recorded books became a more widely available and accepted form of entertainment. In the 1990’s audiobooks quickly grew into an industry of their own. The Audie Awards were presented for the first time and Audiofile Magazine was launched. And already in 1997 Audible presented the first digital audio player. In 2003 Audible made audiobooks available on Apple’s iTunes. And yet, only at this point did CD’s replace cassette tapes as the most popular format. However, in 2008 digital downloads already replaced the CD as most common way to obtain and listen to audiobooks. The programs that first distributed audiobooks to disabled people are still active. Learning Ally is now the largest provider of audio textbooks. Next Caught in the Flames: Be careful in love! You make some very good points that, honestly, I had not really considered before! 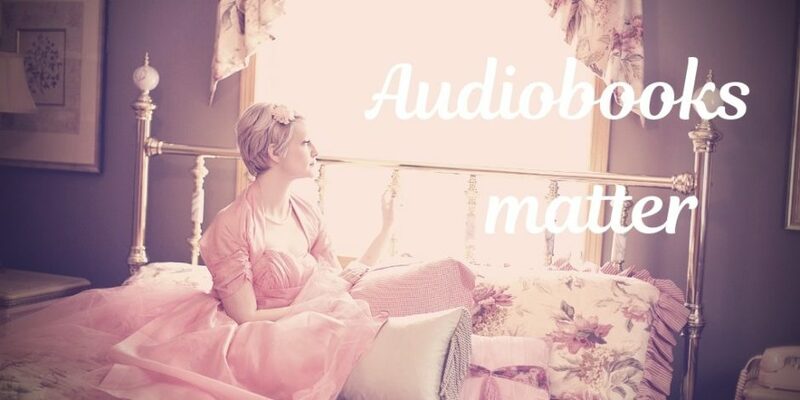 I typically read paper or e-books, but have listened to audio books before and really enjoy them! I knew that audio books would be a great option for those that are disabled but still enjoy literature, but I had not considered the benefits of it helping people with dyslexia. It can likely also help kids who are just struggling to learn to read in general. Helping them become more confident readers can help create confident and eloquent writers as well. Great post! Thank you for taking the time to comment 🙂 Yeah, I think they are a great way to make people love books and stories, and not have them spoiled by struggles with reading. It’s definitely more helpful for the motivation to read than when books are only perceived as a negative thing that’s connected to pressure and failing. Wow, this is so interesting! I didn’t realise that audiobooks went so far back. I’m a big fan of audiobooks as I tend to listen to them while I am walking to work and my partner listens to them as she is dyslexic and can’t read so fast. I still prefer holding a book in my hand but I can’t say that audiobooks aren’t MASSIVELY important. Great read! What a neat blog idea, never knew they’d been around so long. These days, I prefer audiobooks(just can’t afford them) since my eyes have been bothering me. Do people give out free audiobooks for blogs? hmm Great post! They do, actually! I thought I’d make a blog post about that at some point. Since I’ve gathered quite a bunch of sources by now. Audible is the easiest choice. They belong to Amazon. And there are always a lot of deals. You can also often get a cheap audiobook upgrade for ebooks you already own. I never knew that audiobooks where that old! I learn a lot through this post! WONDERFUL POST. For me, listening to book is primarily for conserving my eyesight. I know I won’t have good eyesight all my life. I have never had great eyesight, so really, listening instead of reading is my way of extending my ability to read at all. Plus, it prevents eye strain migraines. But that’s just me, and even if I didn’t have them, I *could* read. For so many people though, that is not the case. I sometimes wish audiobooks were cheaper as well. Blind people often have to save their money and manage it well, and audiobooks can kind of be expensive. It’s a good thing they now carry them in American libraries, at least. I am not sure how many audiobooks are available in my country, but I know that the library for the blind fund has picked up a lot of volunteers to record audiobooks for the blind for free. I volunteered too, but as it turned out, they already had too many! The response was more than they expected, which kind of warms my heart. What a great post. I did know the reason they were invented. I actually don’t listen to them as I can’t concentrate on them. This is super interesting! Thanks for sharing. This is all very interesting. I love the statistics. Lots of good info here on the basics. I especially like the timeline you put together. Did you find any info on US prisoners narrating audiobooks? I’ve only seen 1 or 2 articles on this and find it really interesting. Oh, I hadn’t encountered that at all! I’ll look into it. Interesting article! I really enjoy my audiobooks when im working or cleaning house. Thanks for this interesting article. I always get annoyed when people debate audiobook vs ebook vs printed book. I think it all comes down to personal preference – what works best for you. I’m just glad we have all these different options. I love this article. I am such a huge fan of audiobooks and how they make books more accessible. Great article – I wonder what the future holds ?!?! People will still want books to hold, but on-demand listening will definitely increase. I know technology has gone right into classrooms, so children of today, wont have that love-link to real books to hold. I don’t think books like cassette tapes will cease, but maybe the amount / range of new titles will be greatly reduced ?!? !